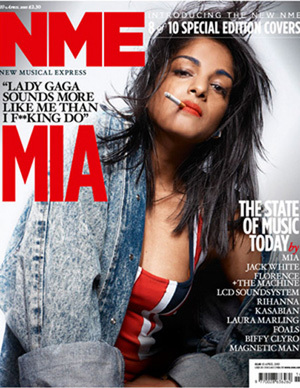 NME remains one of the longest running weekly music magazines in history after its initial publication in 1952. Originally the magazine was published in broadsheet newspaper format using newsprint , and competed for many year with titles such as Sounds (focussing on Rock and Heavy Metal genres) and Melody Maker (mainstream Pop and Chart music). Unashamedly ‘indie’ NME has always championed the cause of UK and US independent music and embraced Punk Rock in the 1970s and 1980s with an excitable fervour – alongside its clear musical preferences promoted by iconic writers such as Danny Baker and Tony Parsons (both now well respected cultural commentators) NME also did nothing to disguise its anti establishment, left wing socialist ideology. Campaigning artists like Billy Bragg and Paul Weller were frequently featured, particularly during the Thatcher era as part of the ‘Red Wedge’ movement.